Big Foot found in Billings Montana over the weekend. Finally proof that the elusive creature really does exist. Wandering in his natural habitat foraging for food. At last proof that Big Foot is alive and well. The physical body is intact ready for scientists to gather data. The wood stove is going it’s pretty cold out 18 degrees outside brrrr chill. We got caught in a blizzard driving home Tuesday. I was so happy to finally turn onto our street. I’m not sure I’m really ready for winter, but ready or not here it comes. How are things going? Are you grabbing the tiger by the tail this week? I am feeling better it’s amazing what a little restorative rest can do. I’ve also been tackling my TO DO list, and that has helped bring a little order to my world. I was hoping to post photos today, but after a two-day class learning Picasa I am clearly in the transitional phase of learning and scratching my head. Hopefully in the near future I will be able to put two and two together and post some photos. What’s new on your horizon? 18 degrees and a blizzard?!?! Take two tropical islands and call us in April. Glad you were able to bring some order to your life! And now that you can use Picassa, you can post your own Bigfoot shots! A tropical island really does sound nice! All the bright colors and the wonderful warm tropical weather. I think learning Picasa will be a good thing in the long run being able to organise my photos will be helpful. Hey Guapo … Because of your love for music, make sure you catch Ohio: The Musical. I always figured Bigfoot resided in Montana. Thanks for the evidence! Grrrr computer issues not fun! Well be sure to take a little break and feel the sun on your back before the weather turns. I hope your computer issues are resovled soon. It’s something goofy I’m sure. Grrrrrr …. 18 degrees!?! Yikes! It’s gonna be 80 here along the SC coast today. 80 degrees! Wow that’s nice and warm. I just had to throw another log on the fire. It’s looking a bit like winter here. I’m slow to shift gears. LOL Whoops…..:+) It’s OK bask in that nice sunshine! If it was nice here I would be soaking it up. It does feel Wintery. I was just thinking of making a little hot chocolate and soup. That sounds good. And I shouldn’t brag about our weather, considering I’m spending the day inside working. 30 degrees, windy and grey here in Whitefish. I am ready to fly south now. All I can say is OMG is it Thursday again already! Whew. You know, 18 degrees and a blizzard sounds like fall in Montana. I think we’ve all got some cold weather coming soon enough — even down here in Florida. I know that’s what I thought this morning how could it already be Thursday so soon. I think the week really did fly by. It was a very busy week for me. Seems as though I ran from one thing to the next. I need a day to recuperate and I think tomorrow will provide that for me. I got so excited to hear Big Foot had been found! Don’t tease me like that! I’m sorry I don’t know what got into me maybe it was watching the Big Foot marathon on TV. I still had Big Foot on my brain. :+) Big Foot on my brain that doesn’t sound right. Did you see Carries video today? I think it’s a great representaion on how a lot of us have been feeling lately. I hope your class went well. For some reason I’m having a tough time commenting on your post about the Twilight Zone. After hearing the intro it made me want to pull up a few old twilight zones to watch. that would be a fun thing to do maybe this halloween we will be staying home handing out candy so this could be a fun addtion to the evening! :+) Thank for the idea. Great to hear! Are you in town or close enough to town to get trick or treaters? For some reason I pictured you out in the county. Probably because of all your beautiful nature pictures. Hi Gina I know it’s a little confusing because I have lived in two different places. The first place is Northern Motnana which is by Flathead Lake and Glacier Park. We also live in Central Montana basically living in a small town out in the middle of nowhere. We did have several trick or treaters it was fun becasue where we use to live we would get 3 or 4 if we were lucky. It all sounds heavenly to me! I’m so glad I can share some photos with you and I can tell you a little bit of what is is like to live here. I have been enjoy learning new things about the rural side of Central Montana lots of farm land and cattle ranchers. Good job on the to do list, it is looking extra nice around here. Thank You Navar :+) I thought that was Big Foot well shoot call off the presses! Go check out Gina’s post today she wrote a post about teaching I think you will appreciate it. G. M Barlean blog. With such bright fur I’m surprised it remained elusive for so long. Our weather has cooled off here too. Fire is going today & now it’s raining. Silly weather. I thought you are in your Sping/ Summer Season now? It must be chilly if your having a fire. Maybe like you said it’s just wierd weather. Love this post and all the great comments Starla. I hope that you stay warm and happy in your beautiful home.I bet you are enjoying those quiet moments when you have many smiles on your face remembering all of the beautiful events in your life. I hope you have many more! I am happy now. Both of my boys are home now. They are both working and well. I am so glad. I hope to have a fantastic holiday season! Happy Saturday Morning Starla … enjoy your coffee. Oh Good I’m glad the video made you laugh :+) I also really had a good laugh her laugh is so cantagious. I’m so glad Webdoc posted. it! 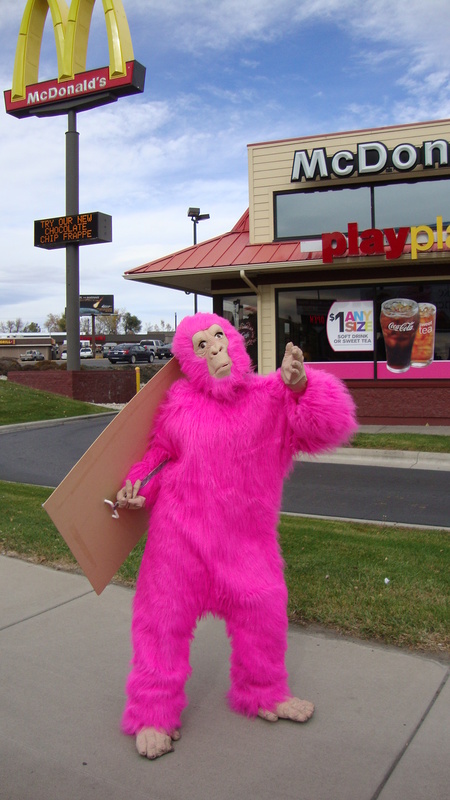 I’m glad you enjoyd the pink bigfoot we really did see this bigfoot in the city of all place’s you would think you would run into BigFoot in the forest nope. I’m so glad to hear you’re finally feeling better. So am I. It’s a wonder what a good freeze will do for a person. I feel better and better the colder it gets. It did take me a little over a week to gather all my strength back but I feel good enough to dance the polka now!!! LOL!!!!! How did you find Picasa? I have it but haven’t been brave enough to go there. I hate new programs but I really want to learn how to use it. Where did you take a class? What a great idea. I learn so well from sight like that. Keep your eye out for Big Foot! Hello Joy, thought you might like this link for picassa http://support.google.com/picasa/?hl=en . Hey Joy :+) I’m so glad your dancing the Polka! Your right a good freeze really can change things. I’m happy we both are feeling better with the colder weather. Life is Good! I took a Picasa class it was a two day class one of the community college classes. I think Navar down loaded Picasa onto my computer I will ask him about that. The first day I did pretty good keeping up the class the second day not so much. I think now I just need to spend time checking things out clicking buttons. He did recomend getting the Picasa handbook he said most of the things he talked about in the class are in the manual. I think I saw Big Foot, too, only he was trying to get me to buy a $5 pizza. That’s funny maybe it was the same Big Foot. :+) I was so shocked to actually see a live Big Foot that I didn’t look at the sign that he was holding maybe he was selling pizza!